How to be a driving instructor, driving instructor courses, training to be a driving instructor. All you need to know about the process of qualifying to be a driving instructor, eligibility, the exams, and the training with us. 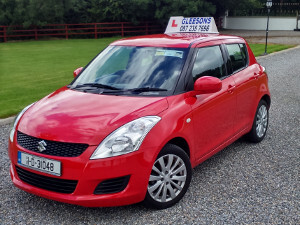 Our driving instructor courses are conducted by highly qualified and experienced trainers in Kilkenny City. Check out our website for details of how, when and where our driving instructor courses take place. 1st steps to your new career. A career where you, are your own boss, and choose your own hours! A career where your own car can earn money for you not drain it from your pocket! A career where you meet lots of people, and provide an important and needed local service! At GDS you can be sure of a completely professional service and at affordable rates. With over 25 years experience in the driving instruction industry we will use our knowledge to help you build and maintain a successful driving instructor business of your own; we won't abandon you once you have qualified. After you have qualified we will continue to advise you on this and included in your training fee, we will custom build a website to help your business grow. Click on the about us page, and you'll see the chief instructors profile. To see if you meet all of the eligibilty criteria go to the Eligibility page on the main menu. There are 3 exams to pass. the part 1 - theory: part 2 - driving; and the part 3 - teaching. See our How to become..page on the main menu for details of the process of qualifiying as an instructor. The first part of your training will be studying for the Driver Instructor Theory Test; the Part 1 exam. Then the training will focus on your driving skills to pass the Instructors Driving Test; the part 2 exam. As soon as you have passed the Part 1 and Part 2 exams, you can start working and earning as a trainee instrucotor. This means you can start earning in a matter of weeks. The final phase of training is for the Driving Instruction skills; the part 3 exam. go to the Training Page for more details. We are currently based in Kilkenny City but are expanding to other centres, including Port Laoise. For details of where and when the training takes place, see the main menu. You can pay for your training on a pay as you go basis or you can pay in advance and get a discount. So if you're not sure if its the job for you, you don't have to make a big commitment right at the start. We can also take payment via credit cards if you prerfer. See our Prices Page for more details. We also train existing driving instructors for their ADI check Tests. See how easy it can be to get top marks on your check test using train the trainer teaching format. See the ADI Check Test page for details. and is vital for ADI check tests, as the ADI check test marking sheet is designed to follow train the trainer format. Our Train the Trainer course includes an extra module designed for driving tuition. Click on the Train the Trainer page on the main menu for more details. Dual Controls and Car Adaptions for disabled passengers and drivers.